2 Type of organization where Amanda is used. 3 Where did you get Amanda? 4 What packaging for Amanda do you use? 5 For how long have you been using Amanda? 6 What is your current version of Amanda server? 7 What Operating System do you use for Amanda server? 8 How many Amanda servers do you have? 9 How many Amanda clients per server do you have? 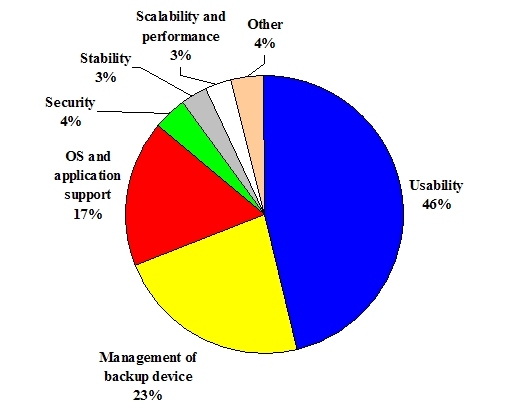 10 What operating systems do you backup? 11 What databases and applications do you backup with Amanda? 12 What is total amount of data for your full backup? 13 Do you use tar or dump? 14 How often do you do full backups? 15 What medium do you use for backups (tape, disk or optical)? 16 What tape drives do you use for backup? 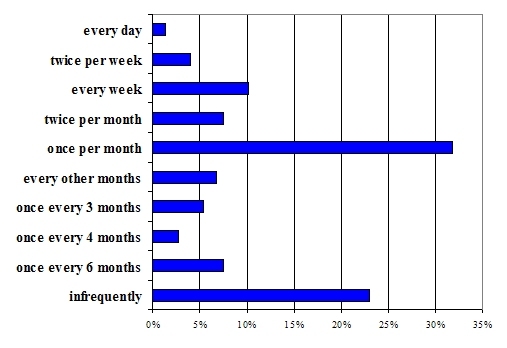 17 How often do you restore files on average? 18 What is your most desired feature that you would like Amanda developers to work on? 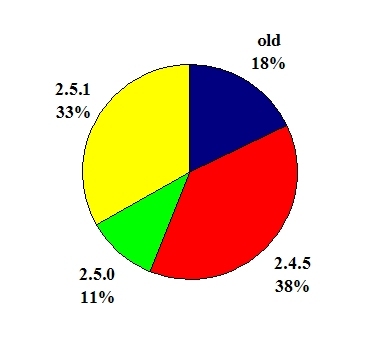 As a follow-up to Results of Amanda Users Survey 2003 in October of ’06 we asked Amanda community to answer 22 questions about their usage of Amanda. Within 45 days we received 165 replies. 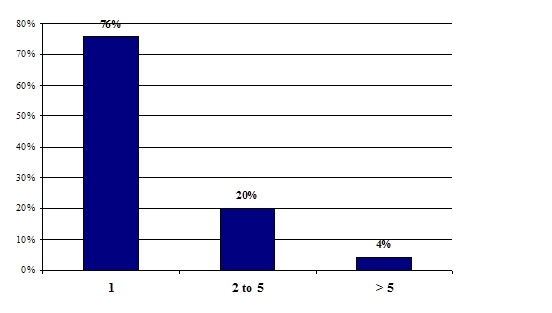 Dmitri Joukovski (dj at zmanda dot com) collected and processed the survey results. Thanks to all who answered our survey and especially to those who provided thoughtful comments and suggestions. Please provide additional comments and suggestions on discussion pages. 95% of respondents would recommend Amanda to a friend. 64% use this Amanda wiki for information. 61% provided additional comments and suggestions for new functionality. Type of organization where Amanda is used. Where did you get Amanda? Some respondents from organizations that have been using Amanda for more than 2 years didn't know where they got Amanda originally and used 'Other' category to answer the question. The 'Other' category also covers FreeBSD ports collection, pkgsrc.org, Freeware for Solaris and UCLA AIX binaries archive. What packaging for Amanda do you use? 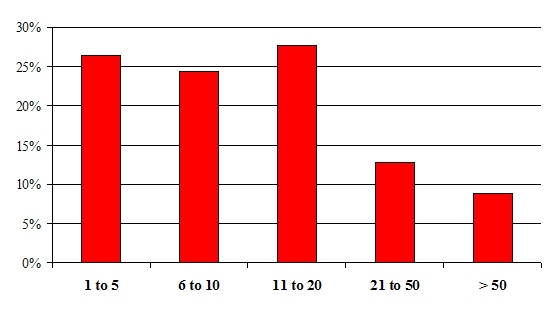 More than half of the respondents compiled Amanda from the source. For how long have you been using Amanda? 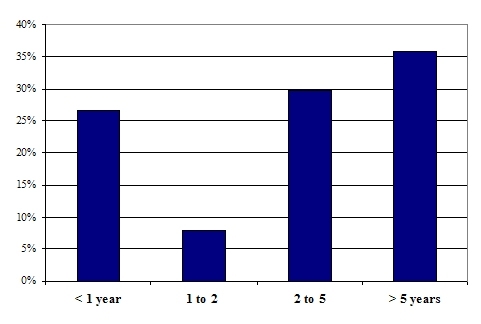 ~70% or respondents have been using Amanda for more than 2 years. What is your current version of Amanda server? As of time of survey, Amanda 2.5.1 is the latest stable version of Amanda. Version 2.4.5 has been released in April of '05. Anything prior to 2.4.5 is defined as 'old'. What Operating System do you use for Amanda server? How many Amanda servers do you have? 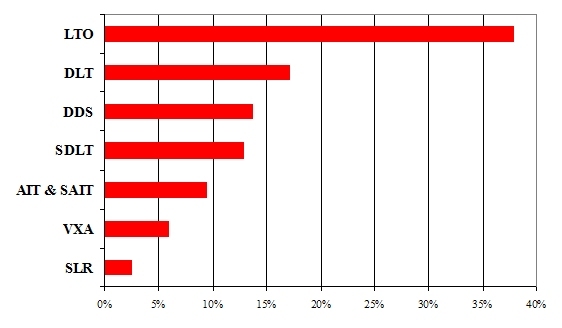 ~25% of respondents have more than 1 Amanda backup server. How many Amanda clients per server do you have? 50% of users have more than 10 clients per Amanda server. 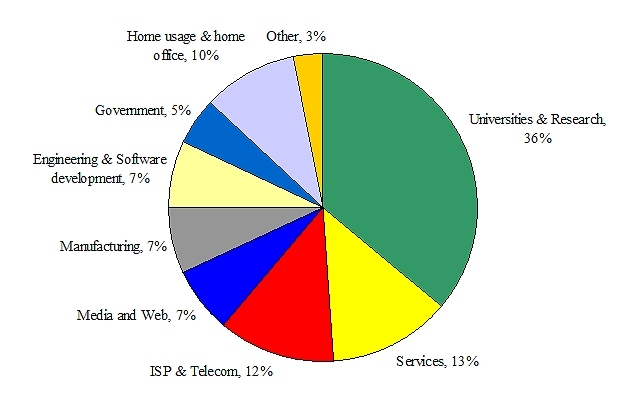 The average number of clients per server for non-home users is 19. One University reported 300+ DLEs. One Research facility reported 120 clients per Amanda server. What operating systems do you backup? The insert with red bars on Fig. 9 shows the number of different operating systems per backup server. 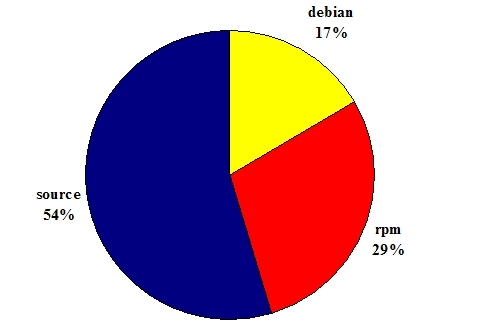 70+% of respondents have 2 or more operating systems. 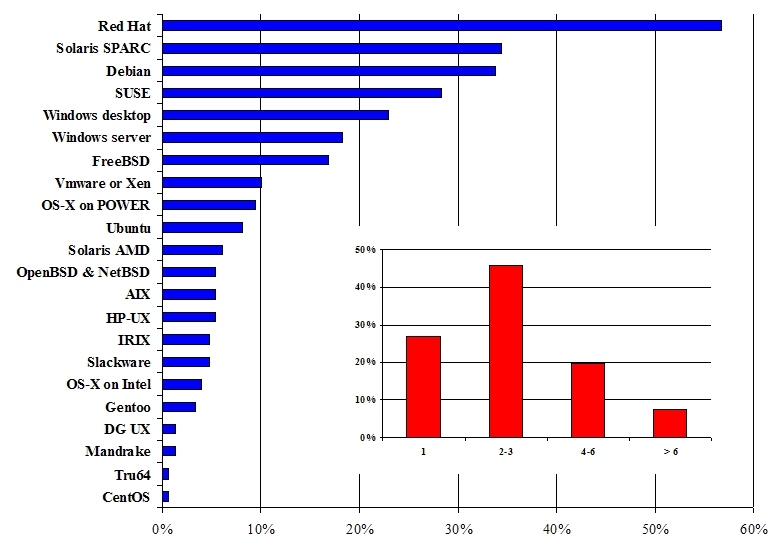 One University reported 13 platform protected by Amanda, counting Solaris on SPARC, Solaris on AMD, OS-X on Power, and OS-X on Intel as different platforms. 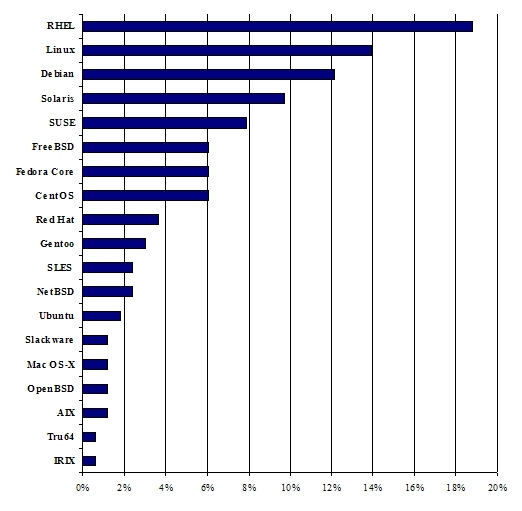 VMware and Xen are not operating systems, but we show them on this chart anyway to illustrate relative usage of virtualization within Amanda community. What databases and applications do you backup with Amanda? What is total amount of data for your full backup? Average amount of data per user is 2.5 TB. Average amount of data per client is 215 GB. 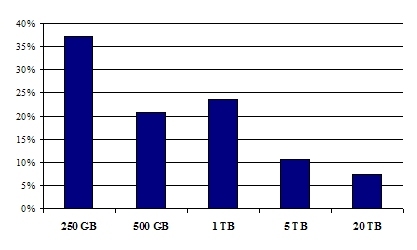 Maximim amount of data per client reported is 6 TB. 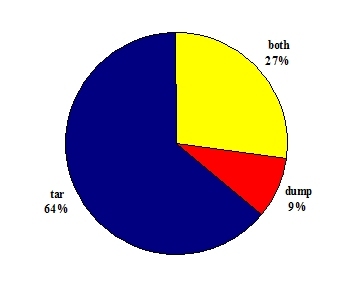 Do you use tar or dump? How often do you do full backups? More than 60% reported 7 day dumpcycle. 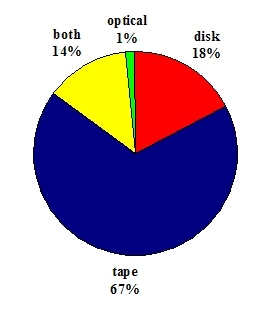 What medium do you use for backups (tape, disk or optical)? Several users reported having more than one configuration, e.g. one for daily backups to disk and another one for monthly backups to tape. What tape drives do you use for backup? 70% use LTO and DLT & SDLT. 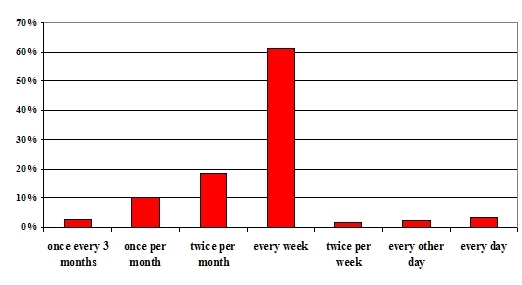 How often do you restore files on average? What is your most desired feature that you would like Amanda developers to work on?